Underneath the 2014 Infiniti QX50's curvaceous exterior is a wondrously-luxurious interior, loads of technology, sporty handling and a strong 325-horsepower V6 engine. It delivers just about everything, and did we say you'll love the interior? Looking for an SUV with curvaceous styling, a smooth and powerful engine, car-like driving characteristics, and a stunning interior? Head on down to the Infiniti dealer and check out the QX50. The QX50 is not the best on overall interior space. If you need more rear-seat legroom or just flat more capacity for hauling things, you probably need something bigger. Infiniti is re-naming its product line and the 2014 QX50 is the same vehicle, with a different title, as the 2013 EX37. Other than the new name, there has been no change of any consequence to last year's EX37. The 2014 QX50 is certainly not Infiniti's top-of-the-line SUV, but you wouldn't know it from a glance at the interior. Everything about it says first-class. The seats are covered in rich leather. There is a wealth of advanced electronic features. The control functions show that very careful attention has been given to their operation. And the detailing is without fault. Where the QX50 falls short, however, is in its relatively small interior volume. The rear-seat legroom can be somewhat cramped and the available cargo space behind it is on the small side compared to others in this segment. But if the size is sufficient for your needs, you're home free. The tidy-sized 2014 Infiniti QX50 makes a noticeable visual statement. There are curves everywhere, and headlights and taillights that wrap around the corners. The proportions are much like a station wagon, yet the standard 18-inch aluminum-alloy wheels and elevated ride height confirm that the QX50 is indeed an SUV. Available 19-inch alloy wheels enhance the QX50's sporty side, as do the dual chrome-tipped exhaust outlets and the rear spoiler. Perhaps the most intriguing exterior feature is Infiniti's Scratch Shield, a highly elastic clear-coat paint finish that, when exposed to daytime heat and sunlight, slowly heals itself of light scratches and scuffs. 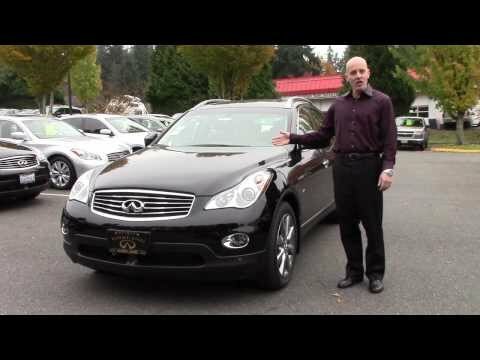 That the 2014 Infiniti QX50 rides and handles like a high-end car is no surprise, as it's derived from the exceptionally nice-driving Infiniti G37 sedan. The 3.7-liter V6 engine is smooth and responsive and delivers its significant power through an excellent 7-speed automatic transmission, while the well-tuned suspension makes the QX50 one of the most fun-to-drive SUVs we've tested. Even better, ride comfort doesn't take a back seat to performance, although some of the smoothness is sacrificed with the optional 19-inch wheels and tires. Acceleration is swift and steady, the steering has great on-center feel, and the handling response and is remarkable for a vehicle of this size. The 7-speed automatic has a very nifty downshift rev-matching feature that assures smooth downshifts and improved stability. Additionally, Infiniti's optional Intelligent All-Wheel Drive system delivers added traction when the surfaces are slick. The base 2014 Infiniti QX50 starts at a Manufacturer's Suggested Retail Price (MSRP) of right around $35,000, while the well-equipped Journey trim begins close to $38,000. A fully-loaded QX50 Journey with all of the options can climb well past $45,000. By comparison, the Acura RDX starts at about $35,000 and tops out around $40,000, while the more expensive German-built Mercedes-Benz GLK and BMW X3 start at around $38,000 and $40,000, respectively, and top out in the mid-50s when similarly equipped. To ensure that you get the best deal, be sure to check Kelley Blue Book's Fair Purchase Price to see what consumers in your area are actually paying for the 2014 Infiniti QX50. As for residuals, the QX50 is expected to maintain an above-average resale value, better than the Mercedes-Benz GLK350 and on par with the Acura RDX and BMW X3, but slightly below the larger Lexus RX 350. The base 2014 Infiniti QX50 rear-wheel-drive (RWD) and all-wheel-drive models feature standard leather seating surfaces, keyless entry and start, 8-way adjustable driver's seat, dual-zone automatic climate control, a rearview camera and a 7-inch color dash-mounted display. Standard audio equipment includes SiriusXM Satellite Radio and a USB port for portable music players. Opting for the Journey trim adds a power tilt/slide moonroof, Bluetooth, power tilt/telescoping steering wheel and heated front seats (RWD only). All trims include six airbags and a full complement of electronic active safety aides. Most of the technological items available for the 2014 Infiniti QX50 are bundled into packages and are available only on Journey models - the upper trim level. The Lane Departure Prevention System that alerts drivers of an unintentional lane change and Infiniti's Intelligent Cruise Control are available as part of the Technology Package, while the nifty 360-degree Around View Monitor is grouped with the 11-speaker Bose premium audio system and hard-drive-based navigation in the Premium Package. Finally, the Deluxe Touring Package adds an 8-way power passenger's seat, driver's-seat power lumbar support, reverse tilt-down outside mirrors, 19-inch wheels, adaptive HID headlights and power-folding rear seats. While any buyer of a vehicle in this category will reasonably expect a certain level of luxury and features, the interior of the QX50 really stands out for its stunning styling, its use of upscale materials, and its fine attention to detail. Conventional cruise-control systems are useful when the highways are relatively deserted, but Infiniti's Intelligent Cruise Control can operate under the most congested traffic conditions by maintaining a preset distance from the vehicle ahead. As traffic slows, the system can automatically reduce vehicle speed - to a complete stop if necessary - and accelerate once traffic begins to move. The 2014 Infiniti QX50's 3.7-liter V6 is smooth, quick and responsive, and develops a driver-pleasing 325 horsepower and 267 lb-ft of torque. The transmission is a 7-speed automatic with a manual shift mode and downshift rev-matching capability, so if the driver decides to shift it manually the resulting downshifts will be smooth and almost unnoticed. The QX50 is EPA-rated at 17 mpg city and 25 mpg highway for the rear-drive version, and 17 city, 24 highway with all-wheel drive. While those numbers may not seem particularly noteworthy, what is impressive is that the Infiniti QX50 produces considerably more horsepower than its competitors while returning nearly identical fuel-economy figures. For those seeking an SUV with that drives like a high-end car, the 2014 QX50 should be on the shopping list. With agility that's remarkable for its size, and a smooth ride over rough and broken surfaces, the QX50 delivers an exceptional driving experience. You'll also appreciate the powerful V6 engine and available all-wheel drive (AWD), which allows the QX50 to deal with just about any reasonably-expected surface. Then step inside and try not to be impressed by the stunning interior, with colors, shapes, materials and surfaces that make this among the most luxurious in the segment. Add in the 360-degree Around View Monitor, the shapely exterior and the wonder of self-healing paint, and it's tough to find a competitor that beats the QX50. Fun to drive with tech glitches. Super fun to drive. My 2014 model has some technology glitches that they are not able to fix. Rear view camera is glitchy and tech often takes a long time to load or does not load at all until the engine is restarted. Otherwise, car has been great. No major engine problems to date and service on my car has been stellar. Its fast sometimes can get away from you. Great car super sporty and fast. Uses a lot of gas which is a lot for me on my long trips. Appealing to the eye and super fun to drive. It is a smooth ride and makes me happy to drive it. My car is very pretty and reliable. It looks sleek and is fast. I do not like the cup holders though.